While this space offers no indication of such, the hustle and bustle of our kitchen has steadily continued over the past months... ebbing and flowing with the hustle and bustle of our lives. So, thankfully, hunger is not the reason for my absence. Over the past few months, interspersed here and there, new recipes have been tasted and tweaked, newfound flavors and favored ingredients discovered... some of which have made it out of my kitchen… to pen... to paper… to photo. 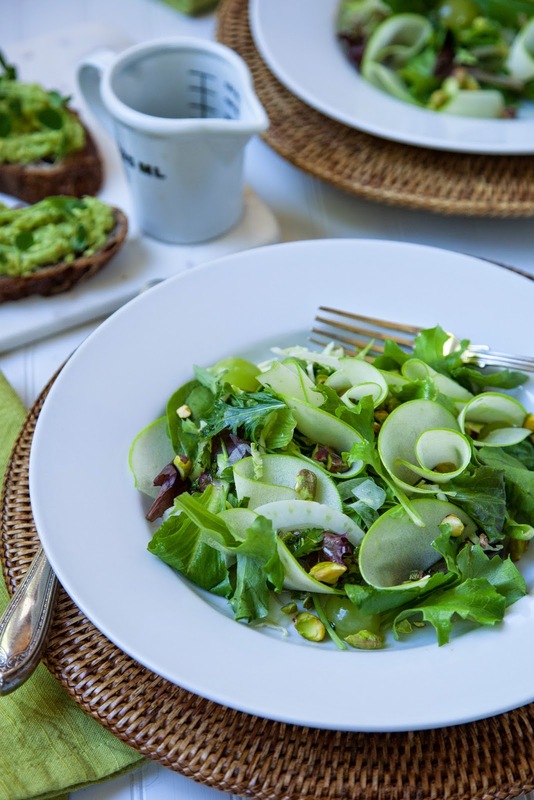 And this week, they are featuring this very Springtime appropriate salad (The Ultimate Green Salad) that celebrates all that is fresh and promising about this season... with a little nod to this month’s particular penchant for green! 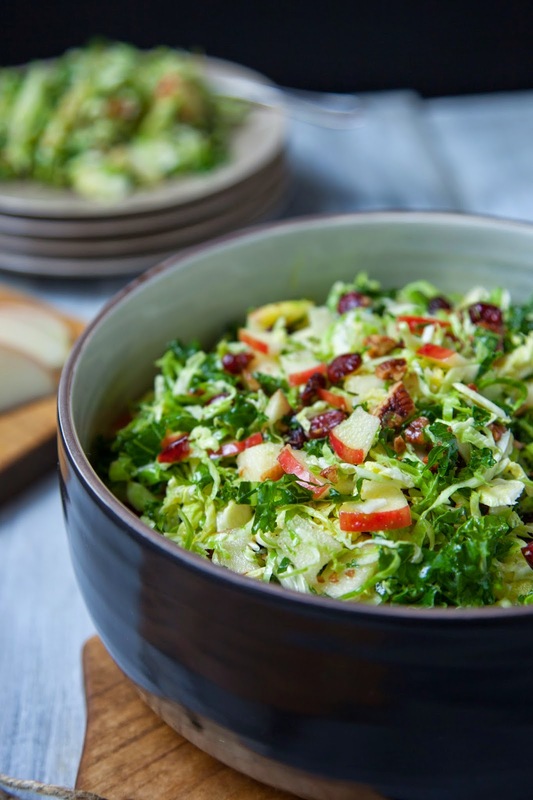 Featuring Stemilt’s delightfully tart and fresh Granny Smith apple, shaved into graceful ribbons, this Granny Smith Apple & Greens Salad with Sweet Lemon-Parsley Vinaigrette is the perfect plating to not only lend a wink and nod to St. Paddy’s Day but to the season, in general. Deliciously fresh, crisp and vibrant in hue, mixed baby greens, shaved brussel sprouts, green onion, celery, green grapes, crunchy pistachios, and parsley come together beautifully to deliver a welcomed springtime salad that is not only pleasing to the eye (with those delicate ribbons of apple nestled here and there), but pleasing to the palate as well. For recipe detail, head over to The Stem. On a gray and rainy Saturday afternoon we wandered into a favored local Italian eatery for some late lunch/early dinner fare... something hearty enough to get us through the remainder of the evening but not so heavy that we wouldn’t welcome the thought of sitting through a three-hour movie afterward. 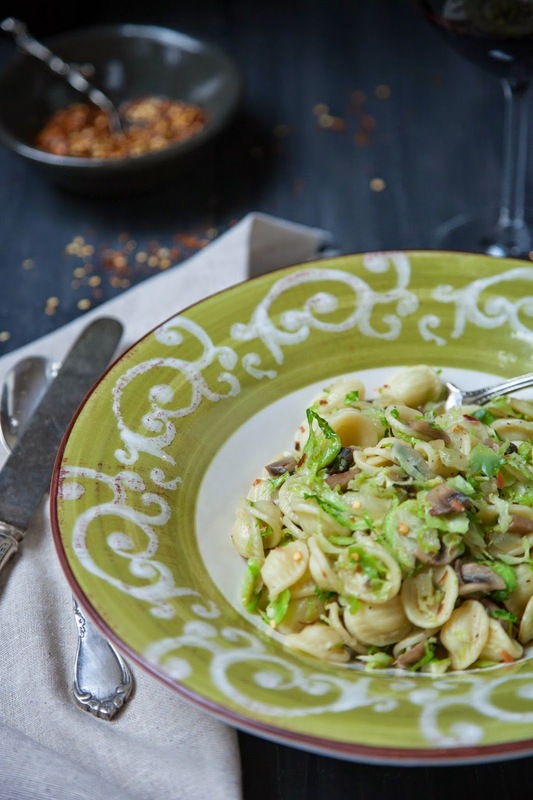 A version of this orecchiette pasta was ordered, times two, and devoured despite one eater’s thoughts that it might have been a touch too salty. As I could drink the ocean, I had no issue with its seasoning. 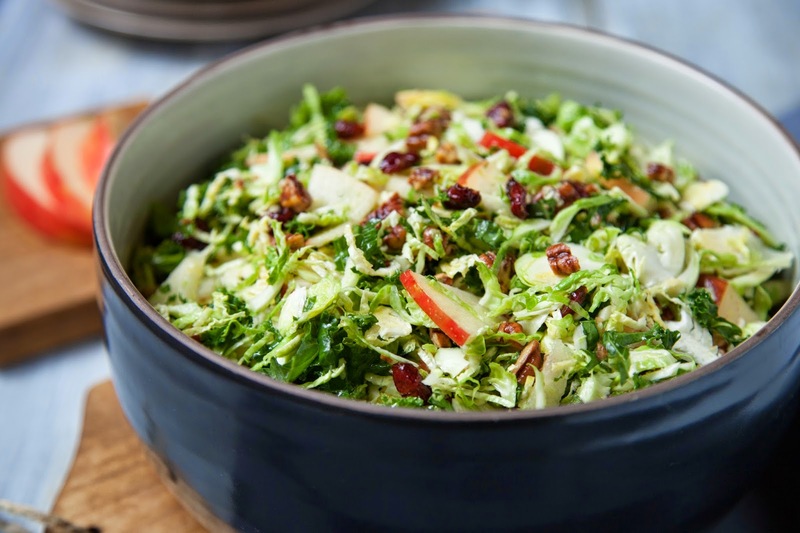 Deceiving in its simplicity and mix of humble ingredients... delicate shavings of brussels sprouts sautéed with a bit of garlic and a few calabrian chiles... it was surprisingly flavorful. And given my growing penchant for just about anything to do with brussels sprouts, a welcome new option for this bright little brassica. While I had no issue with the seasoning, I did have a couple of thoughts on the meal we enjoyed. One was that it would be great with a little added protein thrown in... some roasted chicken, perhaps, or a good pop of sautéed mushrooms… yum. And the other was that the use of chiles for heat (and flavor) was genius. The chili component in this pasta is what truly takes it out of what might otherwise be Dullsville. Yet, instead of the calabrian chiles used in the pasta this was inspired by... chunks of which we continued to grapple with throughout our meal... too much, too little?... I opted for a generous sprinkle of crushed red chili pepper... providing the same (or better) pop of heat and zest with nary a sight of its source. And, keeping it meatless, went with a golden sauté of cremini mushrooms in the mix. 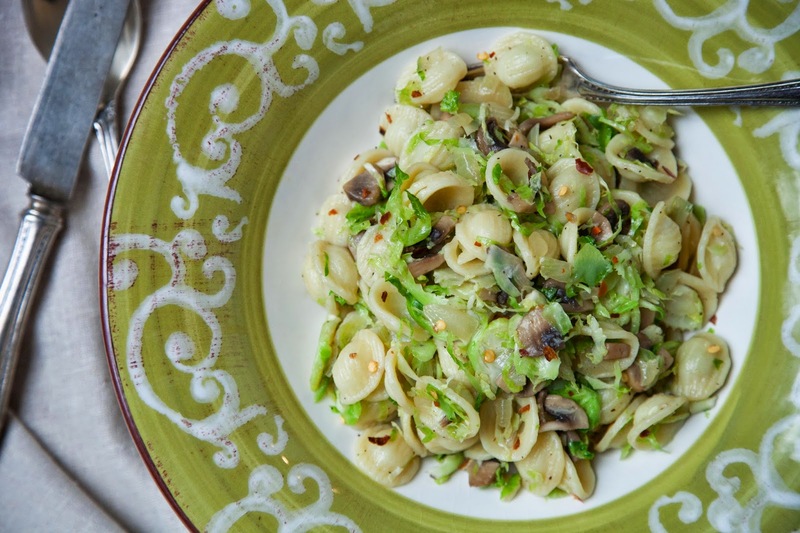 Besides the fact that this comes together so easily, in less than 30 minutes, it could easily be enjoyed as a side veggie without the pasta... the mix is that good! It’s the perfect nestle-in-on-a-rainy day comfort food... hearty, flavorful, and satisfying without being heavy… and very movie friendly. For a family who willingly moved six times in eight years... covering three states and two continents (with kids in tow)... we know a bit about acclimating, adjusting, and accommodating. Change, however, is a different breed altogether. We tend to try to manage change as best as change can be managed... when the mood and manner moves us. That is until you come to the holidays. We have our traditions... not to be messed with or managed. So when I suggested we switch the salad I’ve made for our Thanksgiving meal... one I’ve served for more years than I can remember... approval was required. For a girl who grew up abhorring brussel sprouts, I sold this salad on that little tidbit of fact. Who would change up a proven winner with a dish that was borne on an ingredient that was so despised... unless success was a given? 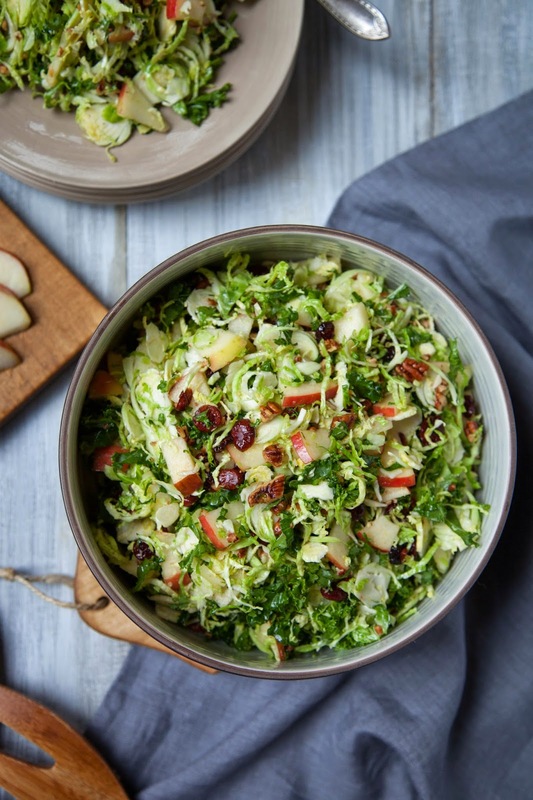 There are so many great ways to enjoy brussel sprouts... far beyond a holiday meal. Yet... when mixed in a raw, fresh manner with Stemilt’s delicious Honeycrisp apple and thinly sliced ribbons of green kale, dotted with sweet, dried cranberries and candied pecans, and tossed with a subtly sweet lemon-honey-cider vinaigrette... these little sprouts take on an entirely new personality, one equally worthy of holiday fare or everyday ease. They are vibrant, robust and ever so appealing and beautifully balanced against the subtle, yet crisp and sweet Honeycrisp apple. 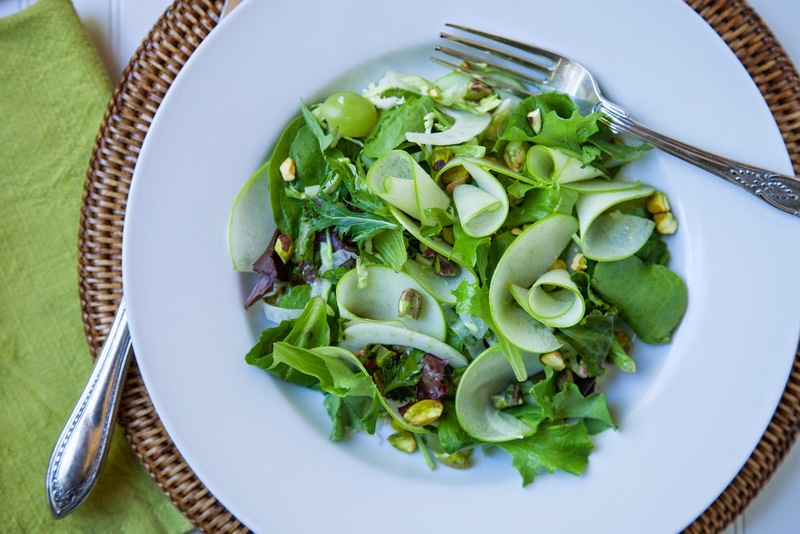 It’s a salad that rewards change and champions new traditions. For recipe detail, visit Stemilt’s blog, The Stem. Though fairly traditional in concept, the Thanksgiving feast is anything but set in stone. There are so many different and intriguing approaches to this meal. I’m always interested in learning of the varied adaptations and twists families make and take in arriving at their particular version. There’s the big bird, for example, and no one way to approach him. Be it stuffed, dressed, roasted, deep-fried, brined, or spatchcocked... Tom can be a versatile guy. 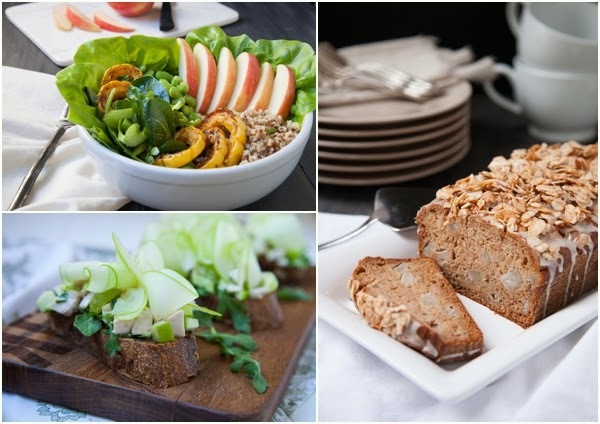 And then there are all the accompaniments from potatoes, salads, soups, and relishes to a host of different veggies... and a myriad of methods to each of these, from the simple to the sublime. Again, varied approaches, none right or wrong. There is one dish, however, that does seems to spark very distinct opinion on right v. wrong and that's the infamous green bean casserole dish. For the most part I’ve found that friends are either in the casserole camp... or they are not. Many seem to have grown up in this camp and later moved on, others never strayed. Growing up, I was one of those in the canned green bean-mushroom soup-onion topper casserole camp... by default. I certainly appreciated the flavor and crunch of this caloric creation, but then I didn’t know anything else existed. It really isn’t until you take charge of the meal yourself that you begin to define your own style. And when I did, years ago, haricot verts (French green beans) quickly won me over. Delicate, tender and a bit more diverse in flavor than traditional string beans, these fresh beans also tend to cook up quicker due to their long, slender profile... and require so very little in extras to make them shine. They are just fresh, delicious beans that play well with just about anything that might find itself on a Thanksgiving plate. Generally I just give them a quick blanch, dry them thoroughly, and then sauté them up with onions and sliced mushrooms, letting them brown up just a bit. However, thinking of this year’s Thanksgiving feast and how nicely the flavor of haricot verts would be with fresh pears... and how beautifully pears (particularly Stemilt’s Bosc pears) roast... I’ve decided to change it up a bit. I’m not switching camps, just tweaking the flavor and simplifying the process. 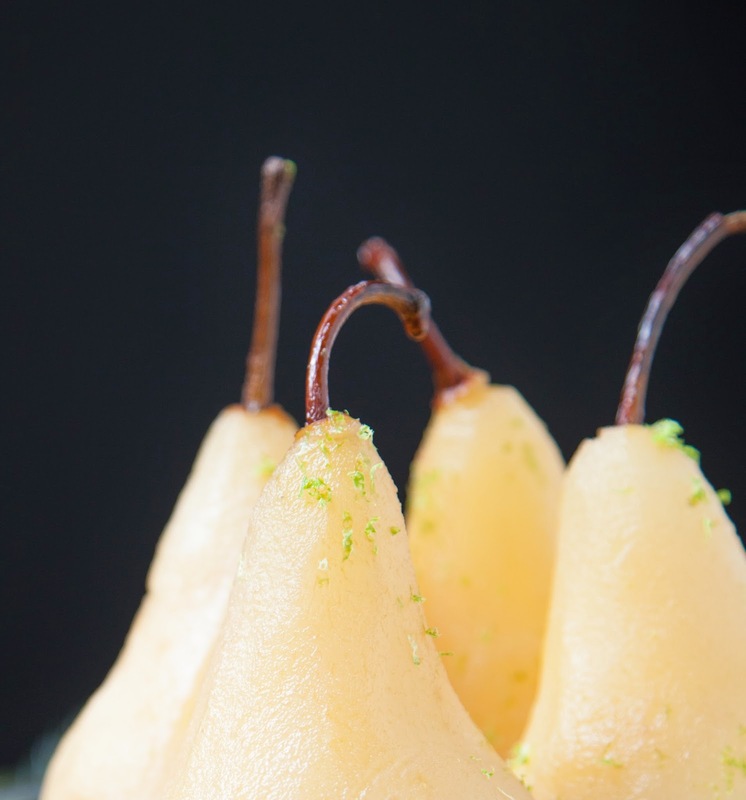 Stemilt’s bosc pears, with hints of fall spices, are a perfect partner in this dish... offering a subtly sweet balance to this savory plating. 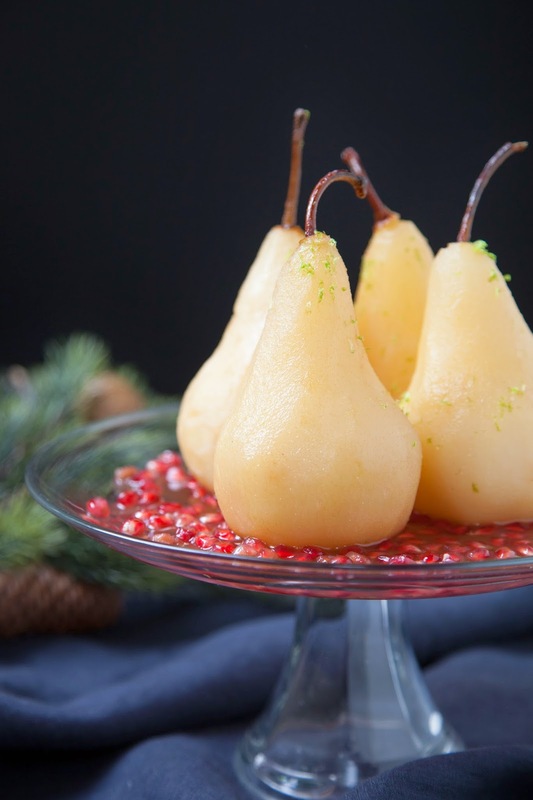 In this preparation everything just gets laid out on one baking sheet, with the pears halved and tucked into the corners of the pan, tossed with a little olive oil and simply seasoned with kosher salt and ground black pepper. Then it’s popped into the oven for anywhere between 15 to 25 minutes, depending on the size of the bean and the amount on your pan (they roast best in one layer, not overly crowded). It’s an easy, quick roast that can be done once the bird is removed and set to rest before carving. 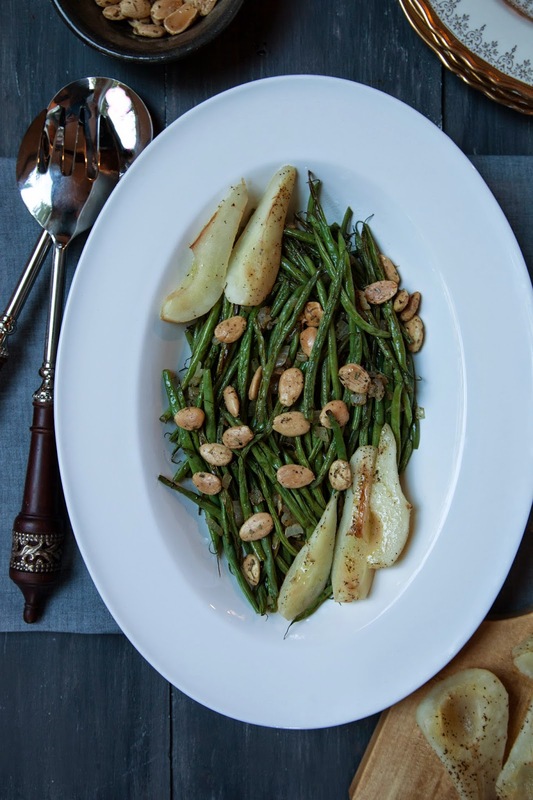 When ready to serve, the haricot verts and pears can be arranged on a platter and sprinkled with herbed Marcona almonds. 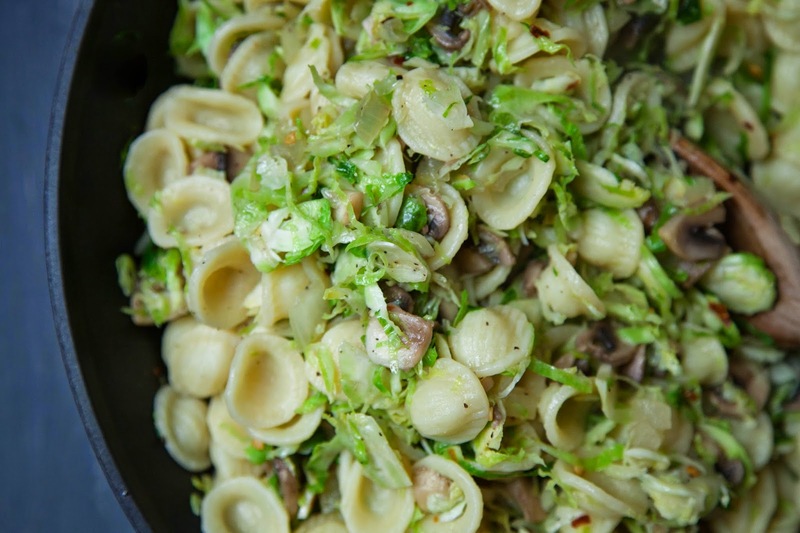 Super yummy and ever so easy... a dish that will make our own traditional feast this year… from the non-casserole camp of campers. For recipe details, visit Stemilt’s blog The Stem. We enjoy a good cup of Jo. And like many Pacific Northwesterners, have become just a bit uppity about our grind. Like a good wine, what’s tasty to one may be too bitter or bland for another. Finding that perfect blend when in our own home or neck of the woods has never really been a challenge. Traveling about, however, the task of uncovering a perfect pour requires some planning and forethought... easily done with a little Google search. Or, if we are either north or south in Seattle or San Francisco, respectively, we simply enlist our offspring who have, to our benefit, acquired this same gene. Having our coffee strategy clearly defined when leaving known territory is a comfort only those who share this mindset (affliction) can understand. For us, the only uncertainty that remains is what to have alongside. Oftentimes it’s nothing, due to lack of hunger... but more often than not it’s simply due to the slim pickings many coffee-centric enclaves offer with respect to baked goods. Though we often just make do with what is available, a summer trek up to Seattle uncovered not only a superb blend but also a more than tasty baked treat at Ballard Coffee Works. This cozy nook hugs the corner of Market and 22nd in the lovely little neighborhood of Ballard, just northwest of downtown Seattle, and a skip and a jump from Ballard Avenue, a quaint stretch of restaurants and boutiques that begs to be strolled. It was here that we had (and continue to enjoy on each of our northern excursions) a great cup of Jo... and a delightful Morning Glory muffin. Each time we visit I look forward to this muffin as much I do to the coffee... and that’s saying something. As such, our visits have been as much about enjoyment as they have about research... determining what makes this muffin so good. It’s the crumb. It’s perfectly moist, subtly sweet, dotted with just the right mix of fruit and nuts, laced with a hint of warm flavor, and capped with a top that is just ever so lightly crisp without compromising texture. 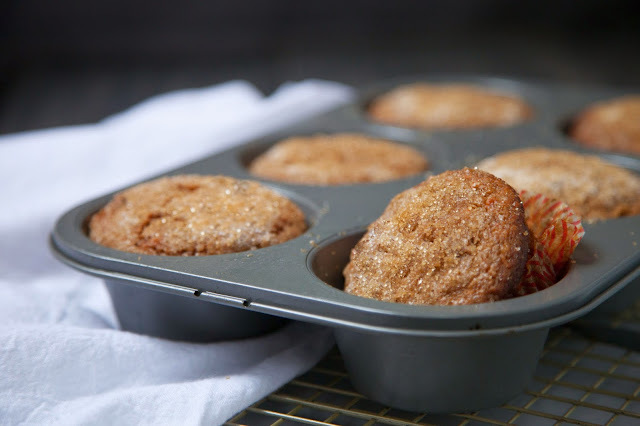 Thinking of this muffin and how best to create my version made me think of Stemilt’s wide array of perfect baking apples... Sweet Tango, Golden Delicious, Braeburn, Jonagold, Pink Lady, and Granny Smith. 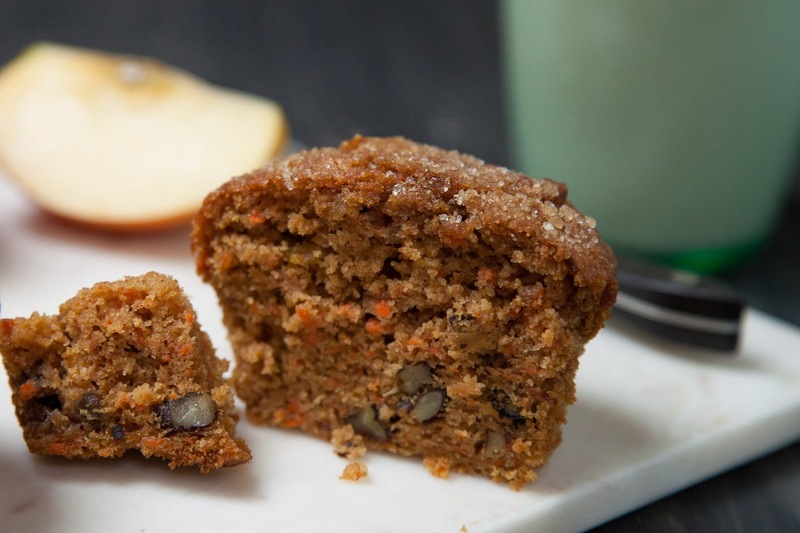 Freshly grated apple, along with grated carrot, creates that subtle sweet flavor that makes the Morning Glory muffin so satisfying. It’s pleasingly sweet, not dessert-like. And, of course, fresh apple contributes greatly to this muffin’s moist, delicious crumb. It’s a muffin that has earned its name... glorious... any time of day. For recipe details on my version of this favorite, visit Stemilt’s blog, The Stem.